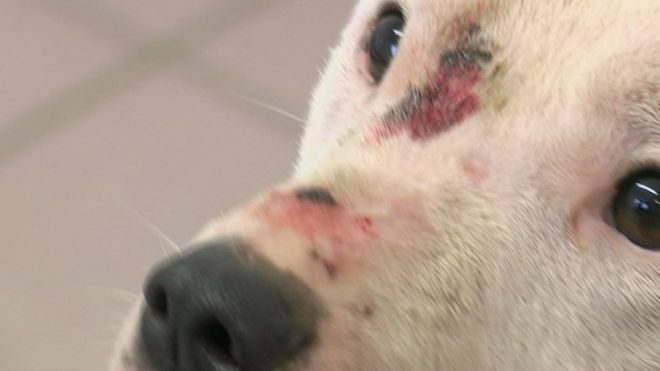 Nearly 5,000 calls about organised dog fighting in England and Wales have been made to the RSPCA since 2006, according to figures released to the BBC. The charity said there had been a total of 137 convictions in the same period. The maximum sentence for offenders is six months in prison and/or an unlimited fine, but campaigners want it to be raised to up to three years. Brian Wheelhouse, who runs a dog rescue centre, said offenders only cared about financial gain and not about the dog. Eduardo Goncalves, chief executive of the League Against Cruel Sports, said: “Evidence from the UK and abroad points to the activity being a ‘gateway’ crime to serious and organised offences, such as drug and gun crime. France applies a sentence of up to two years, and Germany and the Czech Republic apply a sentence of up to three years. Mike Butcher, chief inspector of the RSCPA’s special operations unit, said: “The idea of a six-month sentence is a joke. The idea that you only serve half of what you get is even more of a joke. The RSPCA said the highest number of calls it had received had been in Greater London (924), followed by the West Midlands (469), West Yorkshire (305) and Greater Manchester (238). Rural counties are also affected, including the areas of Kent, Essex and Lancashire. The Department for Environment, Food and Rural Affairs (Defra) said there were “strict laws in place” to deal with people who were not properly looking after animals. Campaigners including the League Against Cruel Sports, the RSPCA and the Dogs Trust, along with the National Police Chiefs’ Council (NPCC) have all called for tougher sentencing as a deterrent. Deputy Chief Constable Gareth Pritchard, the NPCC’s lead for dangerous dogs, said “this kind of animal abuse” caused “untold distress and harm to the animals involved”. We had a call from the dog compound. There was concern because this dog had obviously been used for dog fighting, or as dog bait, with the injuries it had sustained. A dog that attacks another dog will go for the jugular vein – for the neck – so Benji has got injuries all around his neck, [and] around his face. Dog fighting is done by individuals that are fighting them for financial gain. They’re not bothered what happens to the dog at the end of the day as long as it wins. They’re not bothered about the injuries because they’re not going to be taking it to the vets and having it treated. They’ll leave it to heal up by itself. If the dog dies then so be it. To inflict injuries and do horrible things on these poor creatures just beggar’s belief. 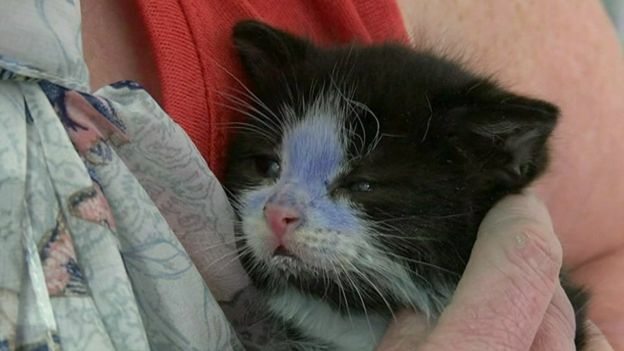 Last year, two kittens were found in Bradford with their fur coloured using marker pens. It is thought they were to have been used as bait in a dog fight, where people would have bet on which one would have died first. They came in through a police officer who’d been to a property and seized them. We’d never seen anything quite like it before – one was coloured blue with a marker pen, and one was green. Thankfully nothing terrible had happened before they came to us. We believe that they may have been coloured in to be used for dog fighting. It was horrendous and we were thinking those cats were probably minutes away from being ripped to shreds by dogs, and they were tiny. We’re aware of other incidents where cats have been used as bait for dog fighting.